Award Winning, Vistage Speaker of the Year 2014/15, Dean Minuto presents his Top Tips from his YESCALATE: GET TO YES FASTER® Course. This series of one minute video tips was created as a summary of what CEOs and Executives who have attended Dean’s Workshop have said are their most valuable application tips. 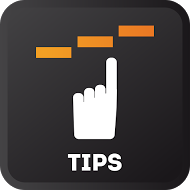 In this section of the App you will find: a FOCUS TIP (Tip of the Month) And individual one minute Quick Tips to help you GET TO YES FASTER®.